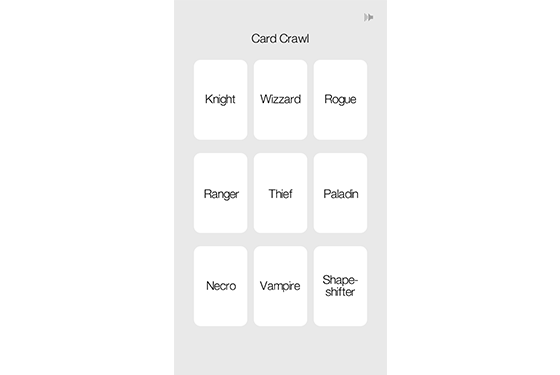 This is Weekly Update #24 with a new Prototype: Card Crawl. It’s no secret that i’m a big fan of Hearthstone. Blizzards collectible card game is probably their hottest property right now. I’ve never played any TCGs before even though Magic is around for decades. As a former WoW Player the idea of entering the World of Warcraft in a less addicting and more accessible way was my gateway to the game. Personally i’m pretty impressed of how little complexity in the rules can achieve an extremely large amount of strategy and emergent gameplay. Especially the minion fights are something i enjoy design wise. The other game, even though i never actually played, it is Scoundrel, which is a game by Zach Gage who is one of my favorite game designers. The clue of the game: it’s based on a regular 52 card deck (with some minor changes). Premise of the game is to work your way through the deck pretty much like in Solitair but instead of ordering rows you have to fight monsters, use weapons and drink health potions after getting hit. In this gameplay video you can take a closer look. I was tweeting Zach the other day when the game will be released, because the gameplay video is almost 2 years old. Scoundrel died before it could see the light of the day – which is very unfortunate. Adam Saltsman, who did the art for the game, expressed his sadness by making his own „Scoundrel-like“ Cubic-Space which takes some of the ideas and compresses it in another great little game. For me it was clear that i have to make my own Scoundrel-like. In the beginning of 2013 i was already prototyping a condensed version of the Hearthstone minion fight. 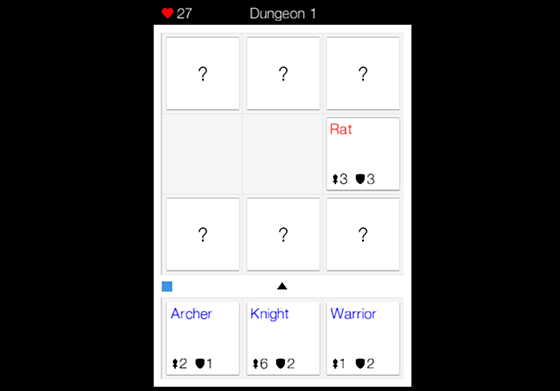 Rogue Cards can be played here (Unity Browser). At that time i did not had the idea of using a regular deck, but creating randomly generated heroes and monsters. The gameplay evolves around going through dungeon rooms with 9 hidden enemies. The player has 3 heroes which can, Hearthstone like, fight against revealed enemies. The randomly generated stats create a little bit of strategy. I liked the idea itself but the prototype did not had the gameplay i was imagining. I canned the project and worked on other things. Last week, coming back from vacation with a lot of energy, i started working on it again. 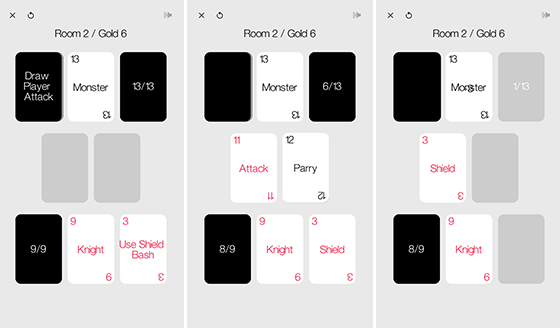 My new Prototype Card Crawl started around the idea of having different classes with unique skills, which face the same Dungeon. The Dungeon itself is a series of 10 rooms which hold one monster each. I use a normal 52 card deck as a base. The basic idea is that you draw cards from the main stack which determines the outcome of battles, strength of your character, strength of monsters and amount of skill cards you will have. The basic interaction is: decide who attacks first, player draws an attack and monster a defense card, decide if the attack is parried or not. If the attack is parried the monster draws an attack card and the player a defense one and so on. If the player dies the game is over. If the monster dies, the player gets the amount of gold equal to the card value and advances to the next room. Then the main stack is shuffled and a new monster is drawn. Skill cards do different things for different classes. For the first class the Knight, the skill card is a shield. The shield gets 50% defense of the original cards value. For example a 12 of Hearts will be a 6 point defense shield. The shield absorbs incoming monster dmg and can be used to perform a shield-bash attack which deal 100% non block able dmg of the shield card value, but the player looses 1 HP from this action. The games are pretty short and highly influenced by card draw luck. But i like the minimal interaction and the minimal strategic depth each class has. Once you complete a dungeon with one class you can start to compete for gold highscores, because each run through monsters will get randomly drawn so each game has a different outcome. I designed 9 classes so far each with a different trade off and different skills. Some are easier some are harder to play, but the variety of gameplay they produces is pretty cool. We will start an early alpha pretty soon, so hit me up if you want to play! Next Saturday (9th of August) a one day Conference called JOIN will be held here in Berlin. The guys from LocalMultiplayer host this little conference which will be pretty great. If you have time you should take a look a the Tickets and come around. We will bring BOX our 2 player strategy game and Card Crawl to play. 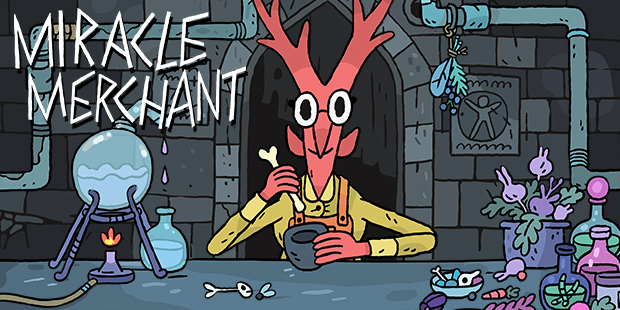 Little remainder for One Tap RPG which will be released next wednesday! Make sure to check it out. We will write a release post and inform all our subscribers on wednesday too. That’s it for this week looking forward to see you all at Join!